Tarnished Hardware... Repolish or Replace? The more expensive Lockset units today have a lifetime finish that contains several layers of a colored, "chrome type" metal that does not oxidize. However, older or less expensive locksets are coated with several layers of clear lacquer. 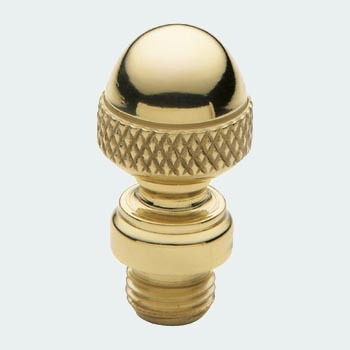 In the original process, the brass was polished to its finished appearance and before oxidation could begin, the item was dip coated in a vat of clear lacquer and heat dried. Maintaining its finish required very little attention and if washed with soap and water or wiped with a damp cloth on a weekly schedule, the finish would remain untarnished for many years. But unfortunately today our busy lifestyles tend to intrude, and in realty the lacquered finish can become scratched and finally tarnished after only short period. Restore Your Door through an associate company owned by Salvador Castillo offers a professional metal repolishing service. 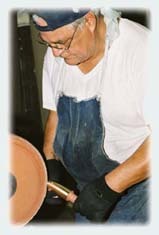 Salvador is an expert at metal refinishing with more than 25 years of experience. As part of our service, your lockset is disassembled and checked for wear. If mechanically sound we repolish and coat the surfaces with 2 coats of ** transparent lacquer to ensure a durable finish. If your lockset is mechanically challenged and in our opinion will fail within a year or so, we will suggest a replacement. Restore your Door offers Replacement Locksets with an OEM Factory "Lifetime Finish", a selection of traditional lockset designs in various finishes from which you can choose. We will also install a lockset that you have purchased from a vendor of your choice. **We warranty the lacquered appearance and finish for a period of 12 months. No warranty is given or implied for the mechanical operation or the metal casting properties of the product.